One of the key challenges is to provide good quality basic education. Quality of education involves use of a suitable curriculum, supply of trained and qualified teachers, and appropriate teaching/learning materials. Most teachers in Laos practice teaching that solely emphasis on memorization and exam-grilling. EDF-Lao SOP Project proposed a solution to the above problem through using lesson study and problem solving base approach. 1) Improve the quality of teaching and learning by improving and developing quality textbook for students and teacher’s guide books and teaching manuals nationwide to reach international standard. 2) Promote usage of the improved quality textbook and teaching guidance book. 3) Expand both student’s and teacher’s intellectual capacity and ability to think autonomously using the problem solving approach in Mathematics. This project is a project that is inter-connected to both Teacher Training at Master Degree Level (TTM) and Book to School Project (BtoS). Please see TTM and BtoS project for more information. TTM Project supplies trained and qualified teachers to consult and train other teachers to ensure the quality of the education. While BtoS provides books to all students it provides SOP Project a starting point to assess the books and materials being used. Appropriate teaching and learning materials ensures quality of education delivery. Teachers from the TTM project along with Ministry of Education and Sport (MOES) and Research Institute of Education and Science (RIES) will help create and design a suitable curriculum suited for actual Lao’s education situation by developing a more appropriate and quality teaching and learning materials. Once these materials are completed, it will be distributed to targeted schools and the team mentioned above will be training teachers in the classrooms. This will be an ongoing process and the textbook materials will be reassess regularly and updated as needed. 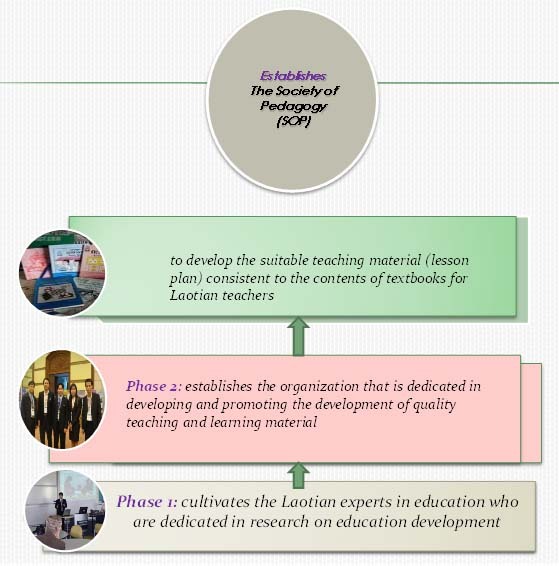 The output of this project is to see the benefit of the new textbook and the realistic effectiveness of the new teaching approach in comparison to the current textbooks and its teaching method. We need good quality teacher’s guidance for actual teaching to sustain a quality educational situation. We also need good quality student textbooks, teachers teaching and guiding manuals in order to have a quality and sustainable education system. If you are in support of this project, make a difference and contact us.